Are you interested in being a vendor at the Madison County Farmers Market this spring and summer? They are having a vendor meeting this Saturday morning, the 23rd, in the conference room at the Madison County Chamber of Commerce. Opening day will be May 14th, just around the corner! And speaking of local growers, two Madison County Master Gardeners are asking local vegetable gardeners to intentionally grow extra produce, or, share a portion of their garden bounty, for Madison County food pantries. Inspired by the ISU winter webinar series on Food Security: Hunger in Iowa, Ron Berdine and Beth De Vries are working to educate the public on the need. Madison County has several food pantries that are willing to accept fresh produce. Preferred items include potatoes, sweet potatoes, tomatoes, squash (summer and winter varieties), carrots, melons, onions, green beans, and peppers. Donation of produce that needs careful cleaning or preparation (i.e. broccoli, leafy vegetables, etc.) before consuming is discouraged. Ron and Beth are willing to pick up and deliver produce to our Winterset food banks. Growers are welcome to deliver their own produce as well. 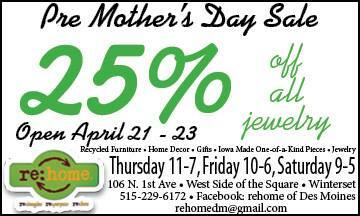 Contact Ron at 515-468-1003, or Beth at 515-669-7103 if you would like more information. If you are interested in participating even though you are a non-grower, there are opportunities for you to help as well. Friday Chamber Coffee this week will be held in the community room at Farmers & Merchants State Bank, and co-hosted by MCFEE and the Madison County Conservation Board. In recognition of Earth Day, participants are encouraged to head out after coffee to assist with litter cleanup along the 1.2 mile stretch of Clark Tower Road that leads into Winterset. Bring your gloves! 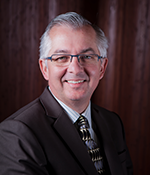 On Saturday morning, Homefront Real Estate is hosting a Home/Buyer Seller Seminar at 9:00 am in their office on the north side of the square, with guest speaker Wayne Martens of Midwest Heritage Bank. Find out why now is a great time to list your house for sale in Winterset! Also learn about the home buyer tax credit program and what loan options are currently available for buyers. Also on Saturday morning, join the discussion at the Legislative Forum and visit with our state legislators in the Iowa Statehouse, Representative Stan Gustafson and Senator Julian Garrett. You will have the opportunity to hear about bills being proposed and debated and how those bills affect Madison County. The forum will be held from 9:00 to 10:00 am in the Farmers & Merchants State Bank Community Room, located at 101 W. Jefferson St. 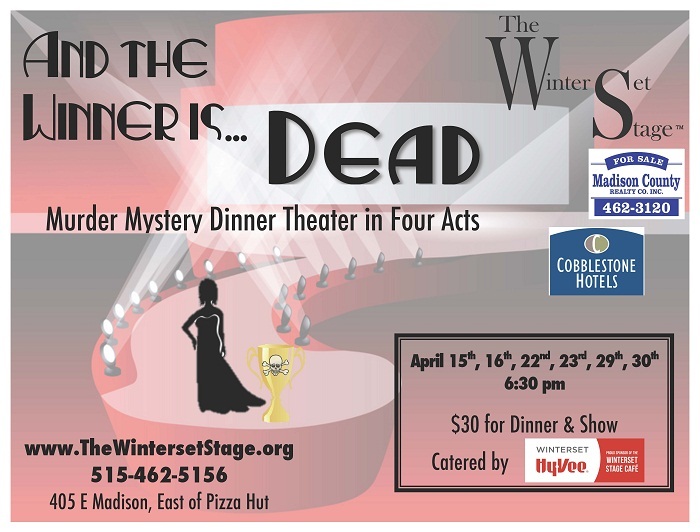 Enjoy a Murder Mystery Dinner Theatre put on by The Winterset Stage this Friday and Saturday evening at 6:30 pm: “And the Winner is Dead.” It’s the night of the annual Hugo Chubson Awards show and the hosts and celebrities are all decked out. Everyone is enjoying the spotlight until one award nominee turns up dead and everyone’s a suspect. Come enjoy a three-course meal catered by the Winterset Hy-Vee and laugh until your face hurts. It’s sure to be a night you won’t forget! Tickets are $30 and must be reserved in advance. Click here to purchase tickets online. Winterset Art Center’s Wine and Canvas night is this Friday from 7:00 to 9:00 pm. Cost is $25 and includes supplies and appetizers. Bring your own choice of beverage. Each event is designed for 12 people, so space is limited. 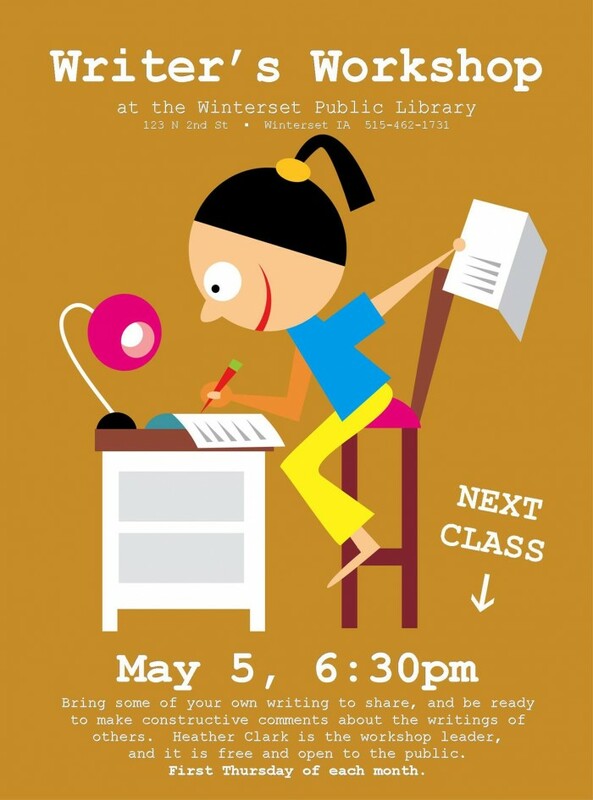 Contact the Winterset Art Center for details and to RSVP 462.4600. On April 26th at 6:30 pm at the Library, Tom Morain, instructor and Director of Governmental Affairs at Graceland University will present “Hymns and Herds: A Year on the Iowa Frontier,” a historical slide-show accompanied by his own piano renditions of golden oldie hymns. Through his music and slides, we will be transported back to frontier days, when the pioneers of Iowa were struggling and thriving through the cycles of the agricultural year. This program is sponsored by Humanities Iowa, Madison County Genealogical Society, and Friends of the Library. Youth entering grades 1-8 in Dallas, Madison, Polk and Warren counties are invited to Taste of Camp June 22-25. This camp is located at the Iowa 4-H Camping Center in Madrid, Iowa. Membership in the 4-H Youth Development program is not required. Activities include archery, building a campfire, exploring a marsh, performing skits, singing songs, hiking in nature, splashing in the swimming pool and the option to zip line or climb a 65-foot wall (only available for “Full Camp” attendees). Youth entering grades 5-8 may attend “Full Camp” Wednesday, June 22nd through Saturday, June 25th. Youth entering grades 1-4 may attend “Mini Camp” Friday, June 24th through Saturday, June 25th. Family members are invited to attend the closing ceremony and campfire lunch on Saturday, June 25th at 10:30 am. Click here for more information or to register. Additional questions may be directed to Regional 4-H Youth Specialist Jeff Macomber at 515.975.2677 or jmacombe@iastate.edu. Registration deadline is Monday, May 9th. 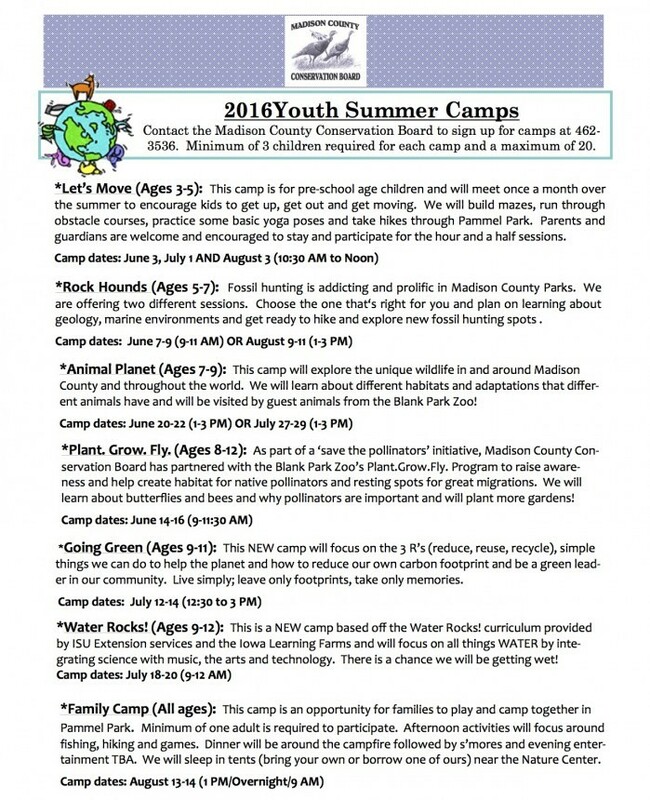 Registration is now open for Summer Camps through the Madison County Conservation Board. Camps run June through August, and there are options for every age range. Register online at www.madisoncountyparks.org, or Click here for a printable application. Spaces are limited. April is Child Abuse Prevention Month, and below is the lineup of prevention and awareness activities for the remainder of April (click here for a printable list). Thank you to CRISP and the many businesses and organizations contributing to this important effort in Madison County. April 22nd is BLUE OUT DAY! Wear Blue in Madison County and make your CARING 4 KIDS heard. April 30th for families with younger children, Picnic 4 Prevention at the Arbor Shelter in Winterset’s City Park from 11:00 am to 2:00 pm. Includes bag lunches by H-Vee (first come, first served), and football and frisbee giveaways while supplies last. Paint4Prevention, Bubble Pool, Plant4Prevention with ISU Extension, Master Gardeners, Piñata, and Prevention Pledge. It’s a fun day! Join them as they close up the month’s celebrations. 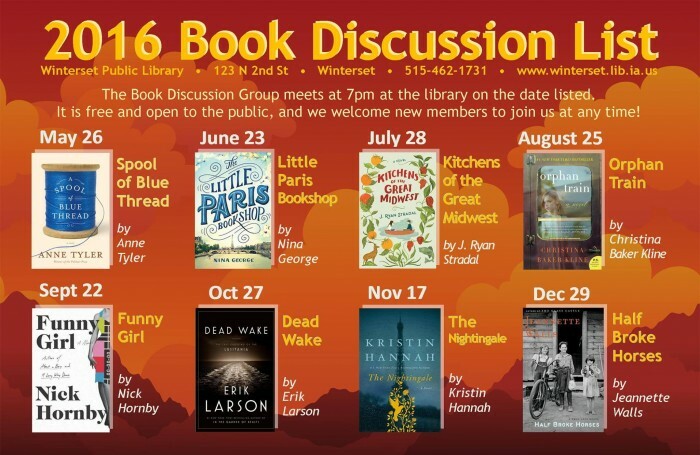 Curious what books will be reviewed this year at the Library Book Discussion group? View the schedule below and mark your calendars! This group is free and open to all. The Book Discussion group meets at 7:00pm in the Library Meeting Room. 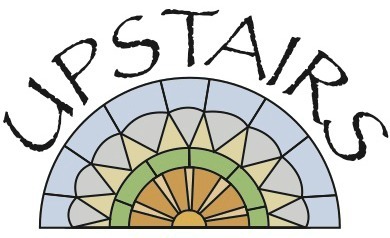 Network with local business owners at the next Chamber of Commerce Business After Hours event on Thursday, May 5th from 5:00 to 7:00pm hosted by the Upstairs at the Heartland Building. Bring your business cards and feel welcome to stay for 20 minutes or for the entire two hours. 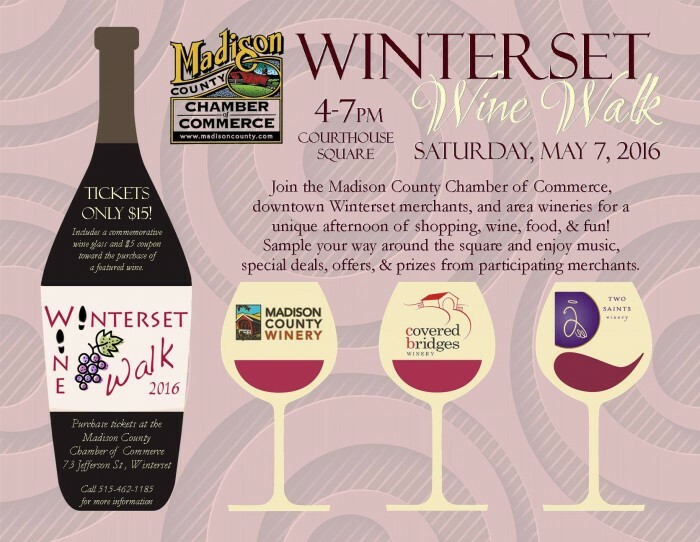 The Winterset Wine Walk is nearly upon us! $15 gets you a souvenir wine glass, plus a $5 coupon to use towards the purchase of a bottle of wine that evening. Tickets are available at the Madison County Chamber of Commerce office, or buy them online here. Madison County Health Care System is excited to partner with the Winterset Dog Park committee to co-host a 5K walk/run and Dog Jog on Saturday, May 14, 2016 in Winterset’s City Park. Proceeds from the event will help fund the proposed Dog Park for Winterset, and there will be events for the whole family (including the dog!). A bounce house, courtesy of Breedings Hardware, a sand volleyball tournament hosted by Winterset Parks and Recreation, The Hy-Vee Healthy You Mobile, and a variety of displays by Madison County groups and organizations will make this a celebration of healthy living. Registration begins at 7:30 AM with the events kicking off at 8:30 am. You may register online by going here. There is a fee of $25.00 (after April 22 the fee goes to $35.00). All registrants for the 5K will receive a commemorative tee-shirt if they register by April 30. Team registration for the sand volleyball tournament will be $40.00 and may be made by contacting Winterset Parks and Recreation Department, which will also contribute the net proceeds to the Dog Park Project. For more information contact Chris Nolte at the hospital (515) 462-2373, Beth McDonald at (515) 462-2951, or Winterset Parks and Recreation at (515) 462-3258.